Item#Union FB9263Black:3″ inch foam face cushion / chest. *Supports up to 350lbs. *Folds for easy transport and storage. *Adjustable to fit your personal needs. *Super light weight aluminum frame. *Comfort Shaped Chest Pad suits various body types. *Carrying Case PLEASE NOTE,SHIPPING CHARGES ARE EXTRA.THESE CHARGES WILL NOT APPEAR ON YOUR INTERNET ORDER,ONLY ON YOUR INVOICE FROM US. 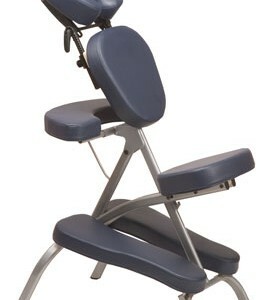 The Avila II is the worlds most advanced massage chair. infinitely adjustable, ergonomically designed and ultra compact. The leg and seat shapes plus the chair angles are expertly designed to provide optimal weight distribution maximizing comfort and support. The Soft Support cushioning system wrapped in Earthlites supple Natursoft upholstery provides the ultimate in comfort and durability. STANDARD FEATURES: Patented composite frame. High quality, Soft Support removable pads. Natursoft Upholstery in seven colors (Amethyst, Black, Burgundy, Hunter, Maries Beige, Mystic Blue and Teal). Compact design. Stainless steel clutches. Package includes: chair, carry case with wheels, sternum pad, valuables pouch and instructional DVD. PLEASE NOTE THAT THERE ARE ADDITIONAL SHIPPING CHARGES ON THIS PRODUCT THAT WILL NOT APPEAR IN YOUR SHOPPING CART WHEN CHECKING OUT. THESE CHARGES WILL APPEAR ON YOUR INVOICE RECEIVED FROM US. The Earthlite TravelMate is a desktop, go-everywhere, massage support system that allows practitioners to bring massage therapy to any home or office. It even works with clients in wheelchairs. Able to position in seconds, the TravelMate sets up solidly on any desk or table top. 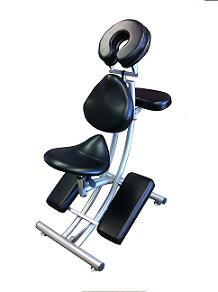 It adjusts quickly and easily, and is able to provide balanced support for a client's head and chest. It weighs a mere 9 lbs and comes with a carry case.Availble on Black only.PLEASE NOTE THAT THERE ARE ADDITIONAL SHIPPING CHARGES“ ON THIS PRODUCT“THAT WILL NOT APPEAR IN YOUR SHOPPING“ CART WHEN CHECKING OUT.““THESE“ CHARGES WILL “APPEAR ON YOUR INVOICE RECIEVED FROM US. Specifications and Features““Weight: 15 lbs “Working weight: 300 lbs “Folds and totes easily “Available In: Seven NaturSoftâ¢ Vinyl Colors, Amethyst, Black, Burgundy, Hunter, Mystic Blue, Teal adn Vanilla Creme “Package Includes:“Carry Case (Black) & Sternum Pad. ALL SHIPPING CHARGES ARE EXTRA,SHIP CHARGES WILL NOT APPEAR ON YOUR INTERNET ORDER BUT WILL APPEAR ON YOUR INVOICE RECEIVED FROM US.